A dedicated surfer and skateboarder from a young age, Mike Tavares has brought his considerable skills to the world of stand-up paddleboarding, where he quickly gained a reputation for being one of the top paddlers in the sport. Skilled in both the flat-water and whitewater disciplines, Mike has been instrumental in working with numerous SUP brands to help move the sport forward. A dedicated disciple of the van life, he travels across the U.S. with his Shred Dog, his faithful canine companion, seeking adventure on the water. We recently caught up with Mike and the Shred Dog to find out what they’ve been up to this summer, and discover their favorite gear. Gear Institute: Hi Mike! Good to see you and thanks for taking some time to chat with us. Can you tell our audience what you’ve been doing lately? Mike Tavares: Since March, I have been travelling across the U.S. paddling (SUP), Onewheeling, and finding all sorts of adventures along the way. For about six years now, I have followed SUP and paddling events around the country competing, doing demos, and promoting the sport of SUP. For the past year, I’ve been doing the same for Onewheel, a company that makes an amazing self-balancing electric skateboard. Most of my travelling has been done in a 24ft RV with my trusty sidekick Shred Dog. This year I have logged about 40,000 miles back and forth across the country. It’s been an amazing journey. Most of May and June were spent following the River/whitewater SUP scene and my focus the rest of the year will be ocean/inland events with a little river sup mixed in. GI: Sounds like you’ve been busy. Do you have time for any other projects? MT: My next big adventure trip is launching in September and will be a 250 mile self support SUP trip (80miles of class II/III whitewater and the rest flat water), in the desert of the southwest. Zack Hughes of Badfish SUP has made three one-of-a-kind 16ft boards for the trip specifically designed to carry all of our gear and bring a good deal of speed to the water. Its going to be a pretty rad journey. Other than that trip, the year will finish out with about 4 SUP races finishing with the 31 mile Chattajack Race in TN, more RV travel, and as much Onewheeling as I can fit into every spot. Onewheels have opened the door for a different and unique type of riding in any terrain and happen to be an amazing cross training tool for about every sport I do, as well as add a ridiculous amount of fun to everyday activities like walking the dog, running to the store, or just messing around. GI: What pieces of gear do you take with you whenever you hit the road? Any favorites? MT: One of the bonus’s of RV travel and road life is that I can bring everything including the kitchen sink, but I try and travel fairly light these days and only keep what I need in the rig. That being said, here are a few things that I use everyday on the road besides all my professional gear. For instance, my GoPro and iPhone with waterproof case. Anyone who knows me or who has seen my Instagram (@Rivershred) or Facebook knows that I am known for taking a ridiculous amount of selfies. While I may get a lot of flack for the number of selfies I post, I usually roll without a photographer to most locations. I rarely go in the water without a camera of some sort because I never know what I am going to get. I like to shoot in quantity and pick through the images on a daily basis. Most of the gems I get are by accident, especially when my maniac dog Shredder comes along! I also carry several Goal Zero solar panels and chargers. I have a full solar set up on my RV, but also use a lot of juice when I am roaming around outside. I have always been impressed with both the small and larger solar kits by Goal Zero. Simple and easy to use is the key in my mind. The Petzl Nao headlamp is a great piece of kit too. I have been doing a lot of night riding on the Onewheel and needed a brighter headlamp. I am super impressed with the brightness at 575 lumens and the fact that you can recharge it too. I have been getting sick of buying batteries lately. GI: And what gear from your sponsors are most impressed with? MT: I simply love the Onewheel. It’s hard to describe how versatile and fun a Onewheel is. It will literally ride any terrain you can handle and bring the feeling of snowboarding and surfing to your everyday activities. I currently have two wheels in the RV at all times and have been pushing the limits of what you can do on one. My favorite type of riding is on mountain trails or on hard packed beach during low tide. In about 15 months I have logged over 1,500 miles and still cant get enough. This morning I rode 2 miles to get coffee and ran the dog for about three miles on City Creek Trail in Salt Lake on a single charge. It’s hard to beat that! My favorite SUP boards come from Badfish, a Salida, CO-based company that only focuses on whitewater boards.. My Primary focus in SUP is whitewater. 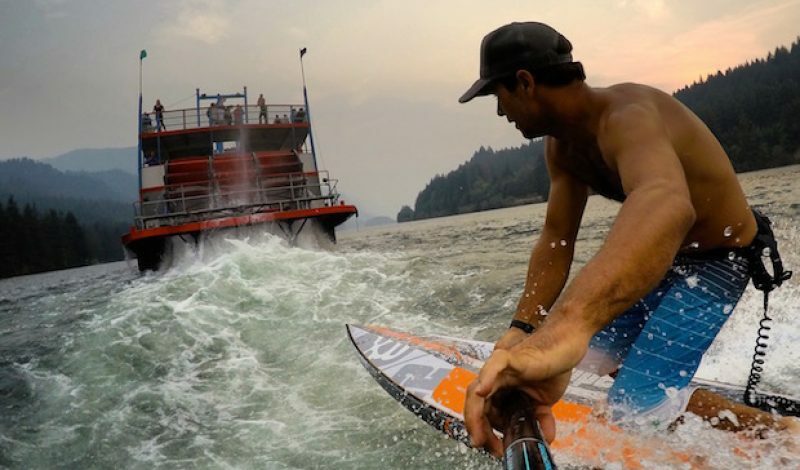 I try to get in an equal mixture of downriver paddling as well as river surfing. Right now my boards of choice are the 6.11 River Surfer and the Inflatable Hole Shot 11ft. The unique shapes excel in river conditions and open up new doors out on the water! When out on the ocean I prefer the SUP boards from Boardworks Surf Boards, an all-around board company that I have been working with for about five years now. My current quiver favorites consist of the Special 7.4 for ocean SUP surfing, the Eradicator 14ft carbon race board, and the Joyride 9.11 (the ultimate dog cruiser board). For me, having a board for every condition is important when covering so much ground on the road. I think that versatility is the key for having the most fun and being able to paddle any water that you see on the road. I also wear a number of different shoes from Astral Footwear, a company based in Asheville, NC that is operated by paddlers. Their shoes have been a part of my go-to gear for years. My current favorite has been the Brewers, a self-draining water shoe that can handle any terrain. It’s my go-to everyday shoe for on and off the water, and it just happens to be the best for Onewheeling as well. The new Felipe Sandals are my other option for a basic flip with an extra strap option and super sticky rubber sole. Finally, I’m a fan of Shred Ready helmets too. Lets face it, most things are safer with a helmet and I use them a lot! Whether it be river paddling, Onewheeling, or skating, I have been using the Standard Fullcut for a few years now. Extra coverage and a nice style has kept my head happy and safe. GI: Are there any tips or tricks for packing your gear that you’ve picked up along the way? MT: Nothing too serious when I am travelling in the RV, but when river paddling I have to be pretty careful about keeping things dry. For example, my self-support trip coming up will need full waterproofness for pretty much everything. I have been pretty impressed with the Watershred Brand drybags over the years. The only dry bag that I never worry about no matter what beating it takes on the water. I will have about 40 pound of gear on my board on my upcoming trip, all sealed in the bags. GI: Is there any one piece of gear that you’re super excited about right now? MT: I know it sounds redundant since I have already touched on the Onewheel, but the applications that this can have in the outdoors is pretty amazing. The rechargeable electric motor mixed with the board-riding feel is opening up doors left and right. It has the same footprint on trails as a mountain bike and actually provides a pretty good workout when riding it hard. Down the road, I can see multiday trips; approach assisted trips, and multi sport experiences over varied terrain. Really the sky is the limit with these puppies and the design team at HQ is always coming up with new things! GI: Anything else you’d like to share? MT: Keep an eye out for pics and a trip report from our 250-mile self-supported trip in late September. My website www.rivershred.com is under construction right now but should be up by then. Try a Onewheel and it will blow you away! Thanks Mike! Good luck on the trip and we’ll be following along.